I hear fine but my family says I don’t understand them, why? Depending on the degree of loss one might begin mixing up words with similar sounds (reach, teach, speech, etc.) or asking them to repeat, or not answer at all. There are many subtle signs. Asking others to repeat themselves, mixing up words, thinking that others are mumbling and more. What type of tests are available to determine if I have a hearing loss? Routine audiometry is completed which includes pure tones, bone and speech testing as well as comfortable and uncomfortable volume levels identification. These examinations, as well as Otoscopy (looking in the ear with a lighted otoscope), are performed by Hearing Instrument Specialists, Dispensers and Audiologists. A referral to a physician or ENT Specialist (Otolaryngologist or Otologist) may be made if routine audiometry suggests it. Why is Speech Testing done? Speech testing determines at what volume level one can hear and repeat back words correctly. Additional speech testing determines your success repeating (more) words at a comfortable level. Speech in Noise (SIN) testing helps identify challenges specifically due to background noise. Our hearing is processed from signals from the outer, middle and inner ear that relay information to the brain. Often the brain has not “heard” correctly for some time. Try looking at the person speaking to you. Use unofficial ‘lip reading’ and body language to assist you in understanding. Why do people mumble all the time? That’s a good question because often it’s the owner of the hearing loss hearing incorrectly, but some people DO mumble and no hearing aid can fix that! I’m younger. Could I be experiencing hearing loss? Yes, it is possible for people of all ages to experience hearing loss. A good rule of thumb is to have your hearing tested annually as you would your eyes and other “annual exams”. Is there anything I can do to prevent hearing loss? Yes! Wearing personal hearing protection such as foam earplugs or custom earplugs in loud environments helps. Don’t turn your volume way up on TVs, radios, iPods, CDs, and others. Limit your time in very noisy or loud environments. My friends with hearing aids are always adjusting them. Can this be avoided? People fidget with their hearing aids for different reasons. They may have been utilizing a push button on their hearing aid to change the sound response, they may be making sure they’re still in the ears. An in-office adjustment may be required to lessen the user’s need to use buttons or remote control. There are so many different hearing aids, how do I know which is right for me? Your hearing aid dispenser is trained to review and recommend specific hearing instruments based on your hearing loss; your preference of in-ear or behind the ear, your budget, your dexterity and other considerations. Why do some people not wear their hearing aids? Some people have a difficult time adjusting to amplification. Those who have waited a significantly long time to try amplification may have a lesser tolerance than those dealing with their loss head-on. Often the longer one waits, the less satisfying the results. That’s why it’s important to have a hearing test annually. I hear some friends hearing aids squealing, why is this? Squealing can occur for many reasons. 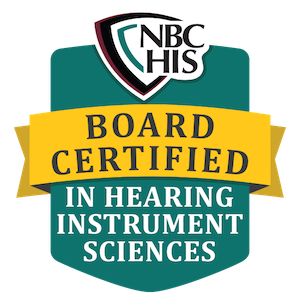 1) the instrument is not properly seated in the ear, 2) there is a moderate to a large amount of cerumen (wax) in the ear canal(s), 3) a vent is too large for the hearing loss, sound can escape. True external feedback is when the sound comes in the microphone, bounces off something in the ear, sound escapes and goes directly back into the microphone, causing that irritating squeal. Visit your dispenser. If I pay more for an aid do I hear better with a more expensive aid? There are multiple levels of technology offered in hearing aids. Depending on the loss, the dispenser or audiologist may recommend a specific aid for the features it has that may help you hear and understand better. An example is an instrument that can handle noisy environments better than another instrument. But solely more expensive does not mean it is a better hearing aid. Your dispenser or audiologist has your best hearing in mind. Everyone claims to have the best aid. How do I know? There are many “brands” of hearing aids. Many offices promote just one product, tying them to a specific manufacturer. I feel that those who offer more than a single brand have more opportunity to fit the patient to their best potential. There are low-end through high-end instruments. Make sure you’re aware of what level of technology your dispenser is recommending (basic, mid-level or premium) and how it applies to your loss. Why should I wear two hearing aids instead of one? Your ears work as a system, as do your eyes. You wouldn’t wear just one lens if you needed two, but many insist that they do ‘just as well’ with a single instrument. Fitting both ears gives both sides of the brain equal opportunity to process sounds. They provide localization of sound and usually better speech understanding. How long does it adjust to wearing hearing aids? This is individual to each person. Some like to adjust slowly, some do better ‘jumping right in’ and wearing them full time. My personal recommendation is to wear your hearing aids in increasing intervals until you’re wearing them all day, every day. Will I be embarrassed to wear a hearing aid? Many of our patients thought they’d be terribly embarrassed before wearing them. Most hearing aids these days are very discreet… the only person who knows you’re wearing a hearing aid may be you! Is there a medical operation to improve hearing? There are several surgical techniques to help improve hearing. These are performed by an Otolaryngologist (ENT) surgeon if it is determined to be beneficial for the patient. There are many testing batteries one would go through to assist in this determination, most being performed by an Audiologist or ENT. Will I have to buy a new hearing aid each year? Usually, no. Hearing aids are not like glasses. When your eyes change, a new pair of lenses is required. When your hearing changes (as identified by your practitioner and/or yourself) your hearing aids can be reprogrammed to your new hearing loss. The general life expectancy of hearing aids is approximately 3-5 years. Don’t forget, have your hearing checked annually. Most insurance companies do not cover hearing aids at all. Some offer a benefit as a Medicare secondary or supplement insurance plan. AARP may offer a benefit to some. I encourage you to call your insurance company to determine if you have coverage. Many offices offer in-house financing to their patients to make hearing aids more accessible to them.